Two hours of party fun! Making mini accessories for your 18” doll or equal size teddy. Choose from ONE of the three themes below! Craft a mini campfire ring, mini smores, roasted marshmallows, camping tote bag and more. 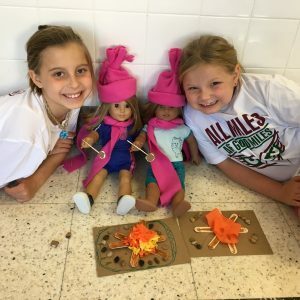 Each girl receives a doll sleeping bag and hat/scarf set too! This party option requires a 8 girl minimum. 2nd grade and up. Note: We can travel to you for this party theme for a travel fee. 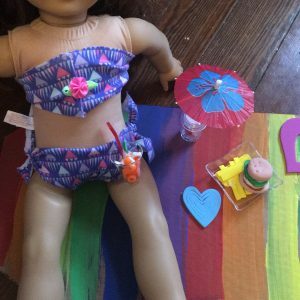 Craft tons of beach themed items for your doll! Surfboard, mini ice cream cones, and more. Receive a doll bikini for each girl and a beach towel! Learn how to make mini pretend party foods and drinks such a birthday cake, mini tropical drinks, mini purses, party hat, necklace and more! 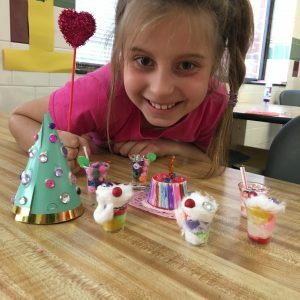 Learn how to make mini pretend party foods and drinks such a birthday cake, mini tropical drinks, mini purses, party hat, and more! We have more party themes to explore! We offer Birthday parties with tons of kids themes in the Northern Virginia/DMV area. Come to our super fun studio in historic Aldie, VA. or we can travel to your home.